Meyer Concrete Pumping & Conveyor Service, LLC was established in 2012 as a concrete and material placement contractor serving the Chicago metropolitan area in addition to south east Wisconsin and northwest Indiana. Our roots however, go much deeper than that. 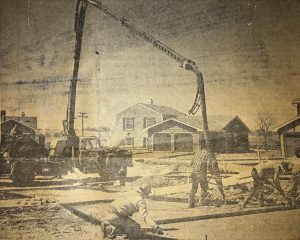 Started in 1965, Meyer Material Company began their concrete placement services as a small family company. Over the next 47 years, the division developed into the name and brand recognized as a leader in placement services across the Chicagoland area by commercial and residential contractors of all sizes. Through the acquisition of Meyer Materials Company’s placement division in 2012, our Concrete Pumping company was brought back to its family-owned roots with an eye for detail and a commitment to provide the highest quality level of service to all of our customers. Through the over 150 years of combined experience gained through our factory-trained and certified operators in addition to having the most-well maintained late-model fleet, we believe we have been able to achieve just that. As a member of the American Concrete Pumping Association, our operators take full advantage of the training provided to them and have all been ACPA certified to the highest standards available. Safety is our priority and we are proud to have a culture where our team members are committed to ensuring such on and off the job. We have a thorough drug test program in which all employees are subject to random drug testing. Contact us to experience the difference today! Our goal is to provide you with the specialized placement services you require with the most reliable equipment and the most qualified operators on your job, and to perform the work in the safest and most expedient manner. Whether your project is 1 yard, or 1,000 yards, our team of experts will be there every step of the way to ensure a successful pour from start to finish. Contact us today to experience the Meyer difference! At Meyer Concrete Pumping & Conveyor Service, our goal is to provide the specialized concrete placement services you require with the most reliable equipment and the most qualified operators, performed in the safest and most expedient manner. Sep 25, 2017 A world free of MS, one yard at a time. Mar 26, 2017 Welcome to the new “Meyer Pumping”! © 2017 Meyer Concrete Pumping & Conveyor Service, LLC. All Rights Reserved.